88 Scott is the embodiment of personal success and style. Maybe it’s time to let the rest of the world know you’ve arrived. 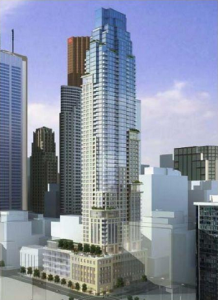 At 58 storeys, 88 Scott will offer spectacular views of the greatest city in the world, day and night. With an architecture that defines modernism, Page + Steele/BI Group Architects pulled out all the stops when it came to designing 88 Scott. With 513 impressive luxury units, owners have a choice of one bedroom or two bedroom suites with most of them providing stunning views of the lake and cityscape. Penthouse level homes are also available, providing spacious contemporary living plans up to 3,500 sq ft with some of the highest outlooks in the city. 88 Scott will be the most exciting and dynamic place you will ever live. Located at the nexus of the Financial District and the St. Lawrence neighbourhood, residence will have complete access to everything Downtown Toronto has to offer. From the high life of Toronto’s art, shopping, dining and entertainment to its vibrant street scene, all of the cities treasures are at your doorstep. Investing in 88 Scott means investing in a city that exemplifies the very essence of sophisticated urban living. >>Contact me to register for 88 Scott, to ensure you are front of the line.